Guides government and nonprofit organizations through the implementation of a performance management system using the Balanced Scorecard. Authors bring a wealth of implementation knowledge and experience to this book, leading to hands-on, practical guidance and tips to that ensure success. 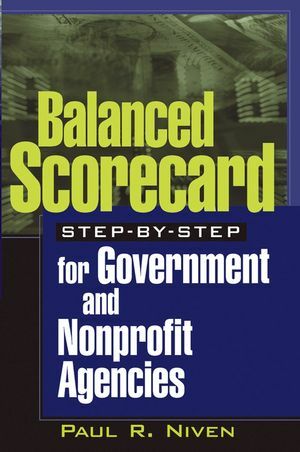 Identifies and tackles head-on the serious obstacles unique to the world of government and nonprofits in implementing the balanced scorecard methodology. Includes action plans to walk the reader through specific implementation challenges. PAUL R. NIVEN is a management consultant and noted speaker on the subject of the Balanced Scorecard. He is the author of the acclaimed Balanced Scorecard Step-by-Step: Maximizing Performance and Maintaining Results. Additionally, his work on Performance Management has been published in many professional publications. Mr. Niven has developed Balanced Scorecard systems for large and small clients in a wide variety of organizations, including the public sector, nonprofits, and the Fortune 1000. He may be reached at (760) 918-5990. PART ONE: INTRODUCTION TO PERFORMANCE MEASUREMENT AND THE BALANCED SCORECARD. Chapter 1: Introduction to the Balanced Scorecard. Chapter 2: Adapting the Balanced Scorecard to Fit the Public and Nonprofit Sectors. PART TWO: POURING THE FOUNDATION FOR BALANCED SCORECARD SUCCESS. Chapter 3: Before You Begin. Chapter 4: Training and Communication Planning for Balanced Scorecard Success. Chapter 5: Mission, Values, and Vision. Chapter 6: Strategy: The Core of Every Balanced Scorecard. Chapter 7: A Balanced Scorecard within Your Performance Management Framework. PART THREE: DEVELOPING YOUR BALANCED SCORECARD. Chapter 8: Developing Performance Objectives on a Strategy Map. Chapter 9: Performance Measures, Targets, and Initiatives. PART FOUR: MAXIMIZING THE EFFECTIVENESS OF THE BALANCED SCORECARD. Chapter 10: Creating Alignment by Cascading the Balanced Scorecard. Chapter 11: Linking Resource Allocation to the Balanced Scorecard. Chapter 13: The City of Charlotte: A Balanced Scorecard Success Story. Chapter 14: Sustaining Balanced Scorecard Success. Glossary of Key Balanced Scorecard and Performance Management Terms.